White snow. Red berries. Winter Solstice. We have 10″ of new snow on the ground this morning. It sure is pretty. Love your red berries. Lovely!! Have a great weekend. Even if I do get the new camera – I don’t think I could ever take such a lovely photo! Thank you. Have a wonderfu’, wintery, weekend! And sunshine too, I notice. Beautiful! Hope you have a “rested” weekend!! 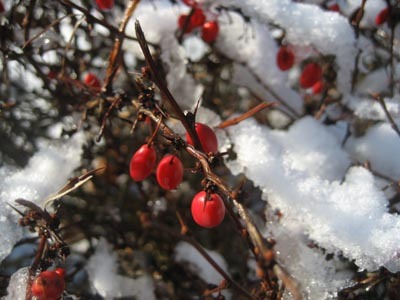 Oooh, everyone has such gorgeous winter pictures on their blogs today to celebrate the solstice! Eye candy galore! Beautiful photo. Also, Lucy’s socks are lovely and colorful. What a sweet present. Merry Christmas my friend. What a lovely photo!